The post How Would Queen Liliuokalani And Father Damien Legislate? appeared first on Honolulu Civil Beat. As Notre Dame Cathedral burned, people — Catholic or not, French or not — mourned. Buildings stand for something — good and bad — that we cannot always put into words. As the legislative session draws to a close here in Hawaii, it is worth asking what the State Capitol, watched over by Queen Liliuokalani and Father Damien, stands for. Will what emerges from the 2019 legislative session be policies that put people before corporations? Will the beloved, principled queen who put her people before her throne, or the saint who gave his life caring for the sick who had been shunned, lend their blessing to what emerges from the legislative chambers of today? The spirit of these two exemplars of good government and love of one’s neighbor hovers over those banging gavels, making speeches and casting votes on the floor, as much as those watching from the gallery, and those chanting for justice from the rotunda. Will our lawmakers respond to the spirit of what Queen Liliuokalani and Father Damien represent or will they succumb to the pressure of contributors to their last campaign — lest they not be there for the next? 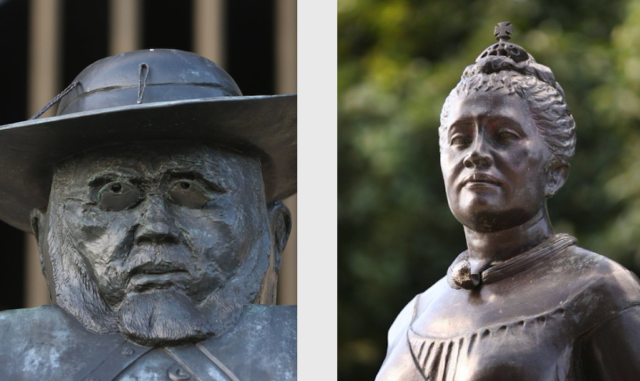 The statues of Father Damien and Queen Liliuokalani on the Capitol grounds. The fight over water rights and REITS has pitted Alexander & Baldwin against the community in ways that have been made clear through the rallies outside the company’s headquarters, and the efforts of advocates from the neighbor islands who flew to Honolulu to be present at the State Capitol at crucial points in this legislative session. Sen. Russell Ruderman invoked the words of Spike Lee last week, reminding his fellow senators of the need to “do the right thing.” Grassroots activism has helped. We are now the paradise of makeshift tarp-roofed “villages” where families — the old, the young, the wheel-chair bound, and those who are working two jobs at minimum wage — barely subsist. The state knows that $21,000 a year does not cover the cost of rent, food and essentials for a single person in this high cost state. Businesspeople like me know this too. What are we going to do about it? I volunteer once a week at the Catholic Worker House on the grounds of St. Elizabeth’s Episcopal Church in Kalihi. It’s an education. We hand out food bags, take in or return laundry, accept or return phones that need to be charged or have been charged, and pass on mail that arrives at this oasis for the needy, run by lay Franciscans. The State Capitol should stand for something that lights a fire within us. He just kept repeating: “I want to die,” even as he politely accepted the bag of food items. I have not seen him on subsequent visits. Each week I hope he will come by again. As we look toward sine die on May 2, we, the people of Hawaii, should ask lawmakers what they plan to do about all those for whom life has reached the point of desperation. All those who cannot pay for their own food and shelter, even after a full day’s labor. Both Queen Liliuokalani and Father Damien put the lives and dignity of people first. Our lawmakers should respect their legacy by enacting a living wage this year. The post Can A Sustainable Industry Be Built From An Invasive Species? appeared first on Honolulu Civil Beat. 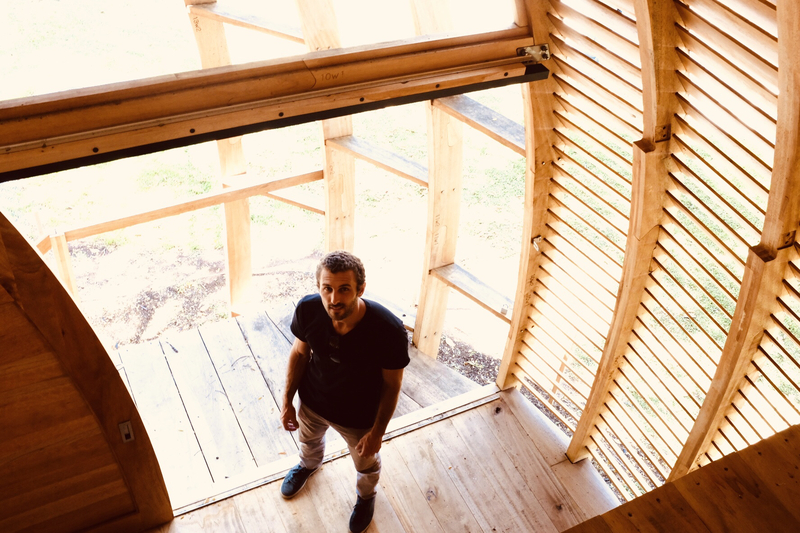 When Joey Valenti built his dome-shaped tiny house on University Avenue a year ago, it was designed in part to rebut skeptics who said albizia wood was too light and weak to use as a building material. Valenti proved the skeptics wrong with his celebrated, striking structure. He also raised another, bigger question: Why couldn’t Hawaii harvest and process albizia as a building material? 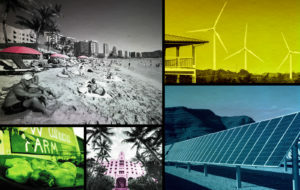 The answers highlight many of the problems associated with growing the manufacturing sector in Hawaii. Even with an abundant raw material like albizia – an invasive species that needs to be removed – growing a manufacturing sector in Hawaii can be daunting. Shipping costs, labor, the need for capital investments, a relatively small and uncertain local demand: all of these pose obstacles to starting something new. 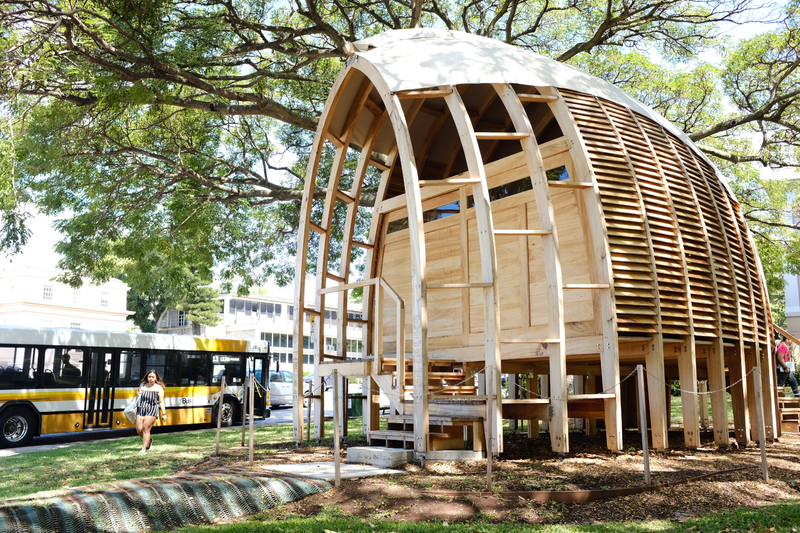 Joey Valenti’s Albizia Project on the University of Hawaii campus shows the invasive wood can be used as a building material. But can it be the basis for an industry? To be sure, there’s no shortage of trees, says Philipp LaHaela Walter, who works on forestry policy issues for the Hawaii Department of Land and Natural Resources. Albizias grow fast, creating a canopy that prevents the growth of native species. They are a fire hazard. And they have a nasty reputation for blowing down in high winds. “If we had built this with Doug fir from Home Depot, would it have been cheaper? Probably,” says Joey Valenti, architect of the Albizia Project. Albizias are such a menace that a group called the Big Island Invasive Species Committee, also known as the Albizia Assassins, has set out to eradicate the trees on Hawaii Island. The organization claims to have killed approximately 12,000 trees in 2017 alone. 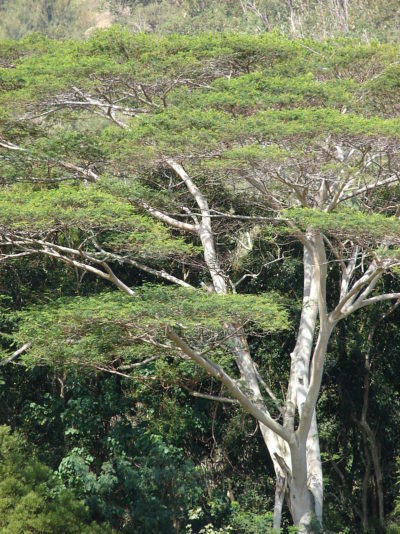 There’s no argument that removing albizia is a good thing, said Walter, state resource and survey forester for DLNR’s Division of Forestry and Wildlife. The challenge is creating a regular supply of trees needed to support an industry. Many of the trees are in remote areas, far from access roads, Walter said. And many that happen to be near roads also are sometimes near structures, which create technical challenges when arborists go to cut them down. And, Walter said, there’s another problem: a relative shortage of wood mills needed to process the trees into planks. In the continental U.S., there are mills that can process a tree every 30 seconds, Walter said. Wood grown in Hawaii can’t compete with that, he said. Plus, there’s the added cost of shipping from Hawaii. “That’s just a level of automation and efficiency that our local operations just can’t compete with,” Walter said. What Hawaii does have, Walter said, is a collection of smaller operations that can fill a niche market for high-end wood. Waimanalo Wood is a case in point. The small sawmill and lumberyard was a co-sponsor of Valenti’s Albizia Project. And Waimanalo Wood’s co-owner, Miles Luedtke, said albizia presents a major opportunity for operations like his. On a recent morning, the mill was buzzing with activity. Customers were perusing the big planks of tropical woods — monkeypod, koa, lychee and the like – that Waimanalo Wood specializes in selling. And in the back of the hangar-like space, Cortney Gusick, founder of Pahiki Caskets, was sanding a piece made out of monkeypod that was destined for Dodo Mortuary in Hilo. It’s essentially a vertically integrated exotic wood seller that makes a business out of processing logs that otherwise would be destined for the wood chipper. Many are trees that need to be removed after falling on people’s property. Miles Luedtke of Waimanalo Wood says the plans to build a house with albizia were met with derision. A big proponent of albizia, Luedtke recalls the naysayers who questioned Valenti’s project. Luedtke’s goal is to create a market for albizia. Gusick makes most of her caskets from the wood, and Luedtke has been experimenting with crafting furniture from albizia. But creating demand is tough, even with the cool structure in Manoa. And until there’s clear demand for the product, there’s unlikely to be an investor who will step up to create a large processing facility, Walter says. Fast-growing albizia trees are an invasive species that the state is trying to eradicate. Luedtke has a vision of small independent operators harvesting trees and processing them into rough cut planks on portable mini-mills. The environment could benefit, and so could local economies, he said. Another idea: to create a cooperative or association of smaller mills to process the trees from rough cut green planks to the more refined dried lumber used as building material. The cost of building with albizia also isn’t clear. Valenti said that in terms of strength and durability, albizia can be processed to be as strong as Douglas fir, a standard material in the construction industry. But Valenti said he is still working to calculate the cost of building with albizia versus wood imported from outside of the islands. Many of his project’s sponsors donated work, so figuring out all of the processing costs is tricky. By contrast, his trees came from the back of Manoa Valley, where they had been cut down and piled up to rot. And that’s the point, says Lynch. 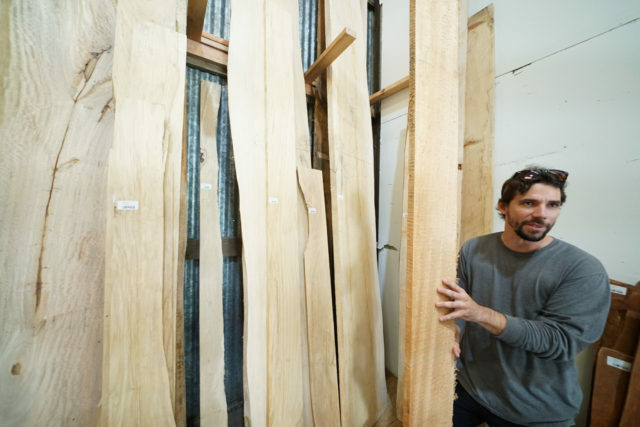 A former banker, Lynch is looking at the economics of albizia and the positive side effects of using its lumber as a building material. Getting rid of a nuisance has inherent value, Lynch said. And there’s additional value in clearing forests to make space for more valuable native trees like koa, which also help protect the watershed, he said. A question is how to quantify and make money off these positive side effects, to turn what economists refer to as positive externalities into a form of capital that can serve as the basis for a new business model, Lynch said. It might seem like heady stuff for an architecture student who merely set out to build a cool house out of discarded trees. But Valenti sees a quickening movement. 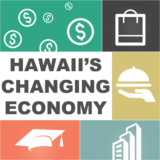 “Hawaii’s Changing Economy” is supported by a grant from the Hawaii Community Foundation as part of its CHANGE Framework project. The post Ige Assures Caldwell Of Ala Wai Flood Control Financing Plan appeared first on Honolulu Civil Beat. Hawaii Gov. David Ige is reassuring city leaders that the state remains committed to help fund the Ala Wai flood control project, despite the Legislature’s refusal so far to pass a spending bill for that effort. In a letter sent Thursday to Honolulu Mayor Kirk Caldwell, Ige notes that the state will include in its biennium budget debt service payments on the $125 million it eventually needs to contribute to the sweeping flood control project. 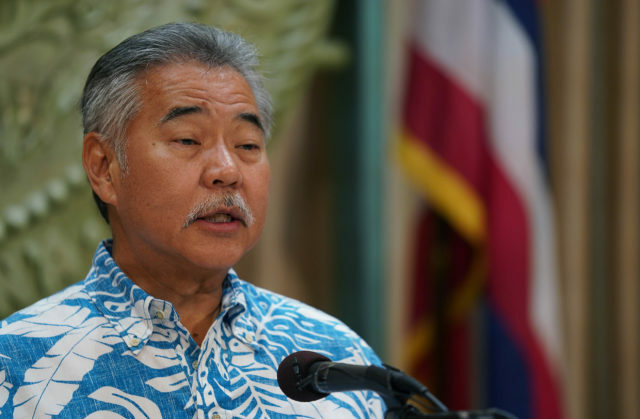 “Consistent with our agreement, I am committed to seek state funding for the local sponsor’s one-time share of the project,” Ige told Caldwell. The move essentially keeps the state’s foot in the door: It allows it to commit some funding now, on debt service, while paying the lion’s share later. The $125 million represents the local match for Congress’ appropriation of $345 million for the project last year, received with the help of former U.S. Rep. Colleen Hanabusa. 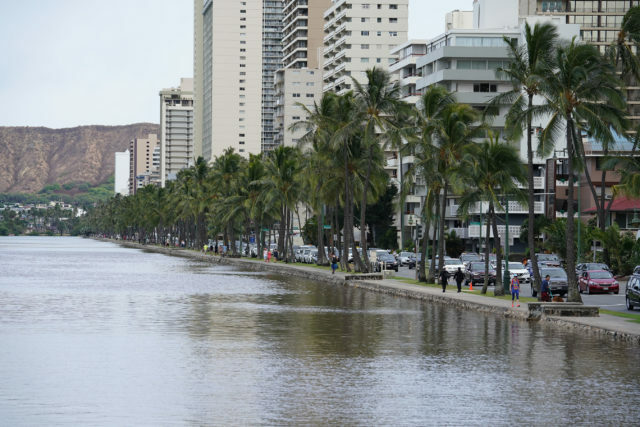 Water levels due to king tides rise along the Ala Wai Canal in 2018. A spending bill for that local match, Senate Bill 77, died in this year’s legislative session after House Finance Chairwoman Sylvia Luke asserted that the city had refused to sign a deal with the U.S. Army Corps of Engineers. Caldwell took issue with that assertion in an April 11 letter to House and Senate leaders imploring that they provide the funding. Army Corps officials have estimated that Waikiki, with its 54,000 residents and nearly 80,000 daily visitors, faces an annual 1% chance of a major flood that would cause $1.14 billion in damage to more than 3,000 structures. The neighboring low-lying communities of Moiliili, McCully and lower Makiki would face residual flooding, they said. The issue stems from costly decisions about a century ago to create the Ala Wai Canal, destroying the wetlands that once absorbed rushing floodwaters and leaving heavy development in their place. 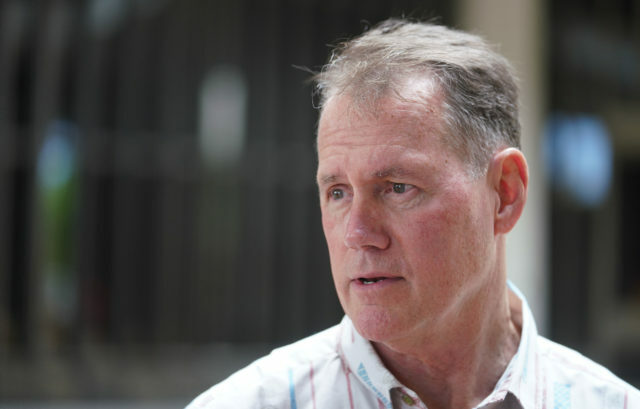 Caldwell said the funding was a matter of public safety for the Ala Wai basin, and that the island risked losing its federal dollars if it failed to provide the local match. Nonetheless, the Ala Wai project has met intense opposition among residents and schools in Manoa and other upland areas, where the Army Corps intends to create detention basins and debris catchment structures. Caldwell was unavailable for comment late Thursday. House Speaker Scott Saiki declined to comment. Ige’s letter to Caldwell was the second time in one day that the governor inserted himself into controversial matters pending before the Legislature. He also sent a letter Thursday to the leaders of the House and Senate asking them to reconsider House Bill 1326, the water rights measure. The governor’s Ala Wai letter also states that the Army Corps agreed to allow the state to defer its payments until after the project was completed. The post Protecting Marine Creatures May Help Slow Climate Change appeared first on Honolulu Civil Beat. 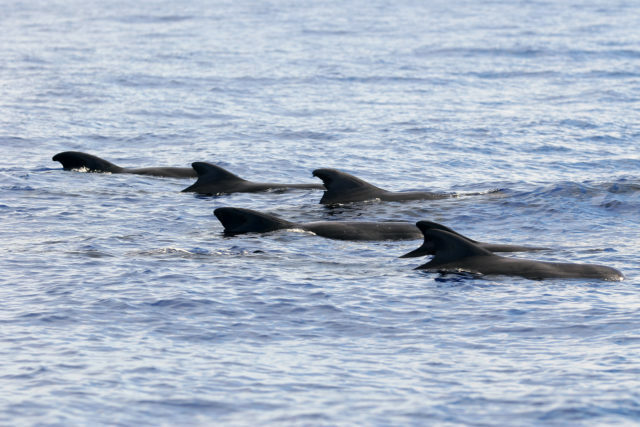 A pod of pilot whales mill off the coast of Lanai. Scientists say whales can trap and store carbon for long periods of time. 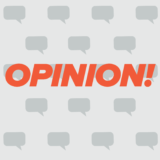 The post Case: Trump ‘Has Not Been Exonerated’ By Mueller Report appeared first on Honolulu Civil Beat. U.S. Rep. Ed Case, Hawaii’s newest congressman who had promised to take a wait-and-see approach to the investigation of President Trump by Special Counsel Robert Mueller, said Thursday he was shocked by revelations in the 448-page redacted version of the report. Speaking to reporters at the State Capitol, Case said an unedited version needs to be released immediately, and that Congress should turn to the courts if the Trump administration is unwilling to do so. “Clearly what I have read of the report is highly disturbing and although Mr Mueller did not find overt collusion, certainly many, many people turned a blind eye” to Russian intervention in the 2016 presidential election, Case said. “There is compelling evidence” that a number of people engaged in activities that “could rise to the level of a crime,” said Case, a moderate Democrat. 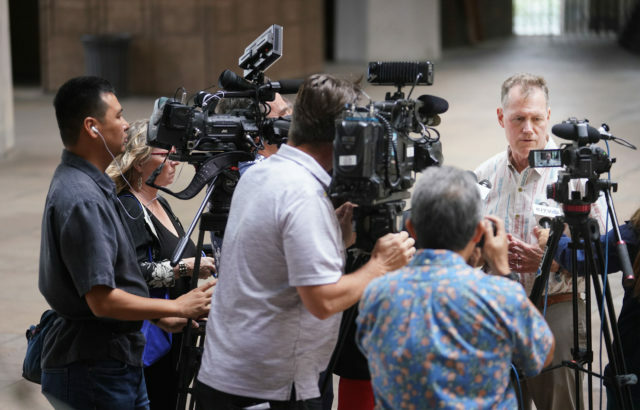 Congressman Ed Case, right, talked to reporters in the Hawaii Capitol Rotunda on Thursday about the Mueller Report. Contrary to Trump’s assertion that the report found there was no collusion with Russia or obstruction of justice, Case said the report makes a strong case for the opposite. Case said that the summary of the report released in March by Attorney General William P. Barr misled the American public. “I think you see a pretty deliberate effort to cherry-pick for interpretations” that would place Trump in a favorable light, Case said. President Trump has called the investigation a “witch hunt” that is interfering with getting things done in Washington. 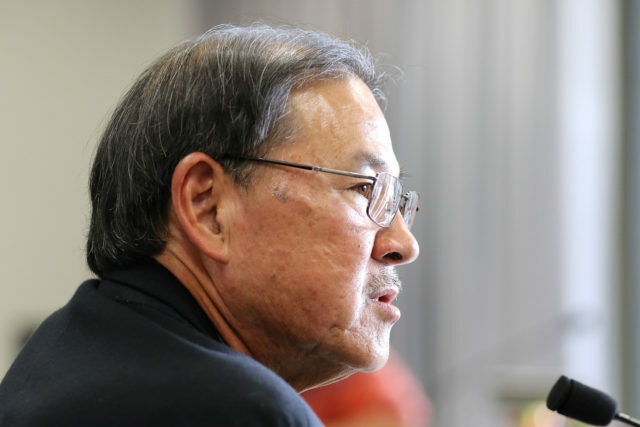 His views were echoed from Vietnam by U.S. Sen. Mazie Hirono. “Despite the Attorney General’s attempt to spin the Mueller Report in Donald Trump’s favor, it’s clear the Special Counsel’s investigation found serious wrongdoing by the President and many of his associates,” the Hawaii Democrat said in a statement Thursday. Hirono is participating in a military fact-finding mission to Asia with Senate colleagues. “The Special Counsel also confirmed what our intelligence community had already unanimously concluded: that the Russian government interfered in the 2016 election to elect Donald Trump,” she said. Case said before he took office in January that he was taking a wait-and-see approach to the Mueller investigation. On Thursday, he had reached some conclusions. The redacted report released Thursday provided evidence that the Russians had sought to interfere with the U.S. election to derail the campaign of Hillary Clinton and promote Trump. “The Russian government interfered in the 2016 presidential election in sweeping and systematic fashion,” the report stated. It also found that the Russians had hacked the Democratic National Committee’s computer network, causing sensitive emails to be publicly released, some of them through the organization Wikileaks. 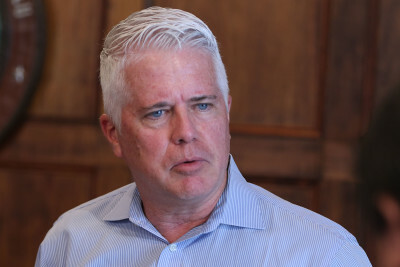 In early April, Case told voters at a town hall meeting in Ewa Beach that he did not believe the initial Mueller report, as represented by Barr, merited an effort to impeach the president. But he said that he would be willing to pursue the impeachment of Trump if he believed the facts showed that the president had behaved unacceptably. “I am not shy about exercising that responsibility if I feel it’s warranted,” Case said at the time. On Thursday, Case said that he continues to believe that impeachment may not be the way to proceed. But he urged people to read the report for themselves. “You can’t read this report without re-evaluating your conclusions to date,” Case said. 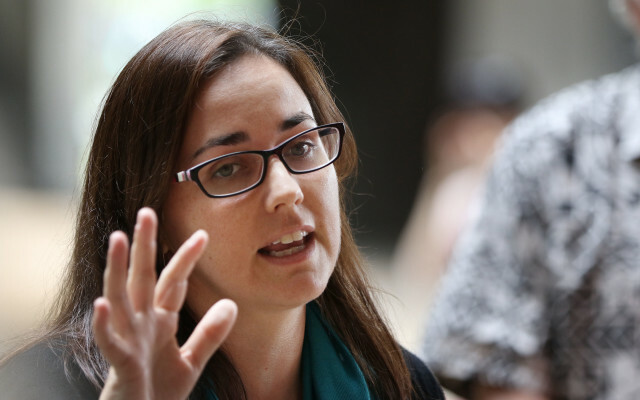 The post Ige Calls For Reconsideration Of Water Bill appeared first on Honolulu Civil Beat. In a significant development, Hawaii’s governor has directly intervened in the legislative debate over a water rights bill. On Thursday, Gov. David Ige sent a letter to leaders of the state Senate and House regarding House Bill 1326, which would extend water diversion rights for land company Alexander & Baldwin, other landowners, utility companies, small farmers and ranchers. Gov. David Ige has told the Legislature he wants to save the water rights bill. Given the timing and circumstances, H.B. No. 1326 addresses these issues for all impacted users in a fair and comprehensive manner. For this reason, I encourage us to continue the conversation and to discuss facts and how we can all move forward to ensure that our State is able to provide the resources needed to support farming, ranching, clean energy production and access to water for drinking and other important public uses. A spokesperson for A&B declined comment. Sierra Club Director Marti Townsend said the governor has overstepped his authority by intervening in House Bill 1326. Townsend, who met with the governor Wednesday to explain the Sierra Club’s position, was referring in part to a rebate that is part of A&B’s sale of land in Central Maui to Mahi Pono, which plans diversified agricultural development. A&B has disputed the Sierra Club’s characterization of the sale. Townsend argued that Ige has overstepped his authority. The Senate has until April 30 to pull HB 1326 to the floor from the two committees where it died two weeks ago. The 2019 session concludes May 2. In response, the governor said, he asked his administration to analyze the implications of not enacting the bill. Ford Fuchigami, Ige’s admistrative director, analyzed HB 1326 and advised the governor to push for its passage. Ford Fuchigami, Ige’s administrative director, conducted the analysis, which is seven pages in length and includes appendices. It includes a summary of the 2015 court case (currently on appeal) that led to the Legislature in 2016 extending water use by A&B and the other companies for three more years. Click here to view the redacted version of Special Counsel Robert Mueller’s report on the Russia investigation. 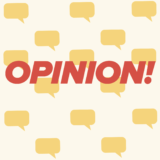 The post Read the Mueller Report Here appeared first on Honolulu Civil Beat. The post Substandard Conditions Frustrate Orchidland Lot Owners appeared first on Honolulu Civil Beat. 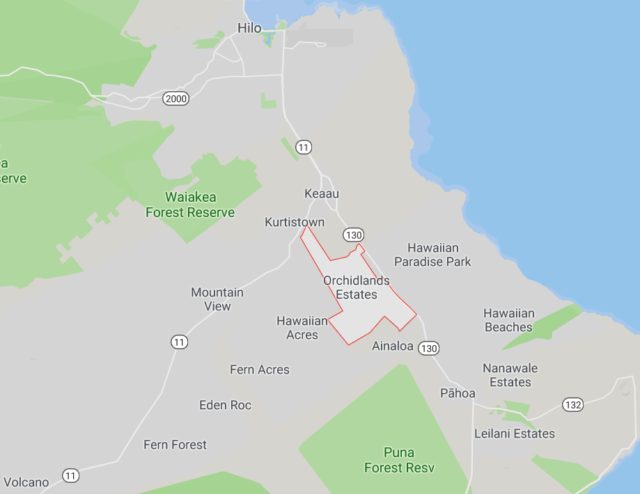 I first came to Orchidland Estates, in the Puna District on Hawaii Island, in 1995 for my wife’s 25th high school reunion. We were only here for 10 days but I was so enchanted that I could not make myself get into our rental car. We almost missed our flight. We house sat on 37th during two summers. My wife had a year off in 1998-1999 and we spent the year in Orchidland. In the fall of 1998 we bought a two acre lot on 37th Avenue between Aulii and Ilima. That year I was also active in what is called Orchidland Community Association, Inc. I was on a committee that established Orchidland’s first road paving plan. Attending my first general meeting in 1998, and several monthly board meetings after that, gave me first hand experience of the rough and tumble nature of unsupervised subdivision associations. From my perspective there was general confusion among active property owners about the nature of our association. As a result, I began to research the legal structure of Orchidland. This structure is made of the deeds for the 2,490 lots in the subdivision. There are no covenants or restrictions recorded with any of these deeds. There is no mention on any deed that the owner is a member of OLCA. In fact, there is no mention of OLCA and its court-entitled powers to assess and collect road fees. I learned that the associations in two substandard subdivisions had taken lot owners before the Third Circuit Court in Hilo. These were Paradise Hana Huilike, claiming to rule Hawaiian Paradise Park and my own OLCA, claiming to rule Orchidland. The PHH case had even reached the Hawaii Supreme Court in 1983. A screen shot from of a Google map marking the location of Orchidland Estates on Hawaii Island. I read that the Supreme Court had found, in fairness, that there were duties and obligations among the lot owners in Paradise Park for road maintenance. The Supreme Court ordered our Third Circuit to find a solution. The Third Circuit chose to “entitle” PHH in the guise of a Hawaiian nonprofit incorporation. In fact, PHH is an agent of the court. The Supreme Court did not require the Third Circuit to “entitle” PHH to manage the roads. That decision is entirely on the Third Circuit itself. In 1983, the Third Circuit had expressed doubts that PHH was “fairly structured to carry out the functions of road maintenance and the setting of fees and collection.” Before “entitling” PHH, the Third Circuit gave PHH 60 days to amend its bylaws. To insure compliance, the court maintained control over PHH indefinitely. This is the supervision OLCA requires now. OLCA has taken lot owners to court twice. Both times the Third Circuit chose to “entitle” OLCA to manage the roadways in Orchidland. The court did not find any problems with the OLCA bylaws and it did not require amendments. Nevertheless, in 2014 a rumor spread among the active lot owners that OLCA bylaws did not comply with the Hawaii Nonprofit Corporations Act. According to this rumor, the bylaws, approved on two occasions by the Third Circuit, were illegal. And in order to bring OLCA into compliance with Hawaii law, there was not enough time to follow the procedure in the bylaws. On Nov. 16, 2014, OLCA did change its bylaws. And it did not follow the procedure required in those bylaws. And the consequences have been significant. The breach has left Orchidland confused and split between two factions. I have sued OLCA for breach of the contract constructed for us by our Supreme Court and our own Third Circuit. To be more precise, I am suing for the Third Circuit to supervise its agent, OLCA. Again, on Feb. 21, the Third Circuit confirmed its opinion that I had no legal right to complain, as an individual property owner, about any action taken by OLCA. If a property owner in Orchidland has no right to complain to the Third Circuit about a breach of the court’s arrangement, then to whom does he or she complain? Perhaps the state Legislature? Ironically, it was the very next day, Feb. 22, that the Hawaii House expressed itself on the quality of the judicial system’s oversight of substandard subdivisions. In HB 288 our representatives provide an adequate description of our plight, but the bill did not pass. The legislature believes that, because the counties approve housing subdivisions and collect real property taxes from the owners in those subdivisions, it is appropriate that counties establish rules and procedures for, conduct audits of, and act as an oversight agency of the housing subdivisions or be required to maintain and repair the infrastructure of the housing subdivisions. Hawaii County’s responsibilities are clear. And when Hawaii County has met these responsibilities, I will pay road fees to OLCA or to any other association in Orchidland that has our county’s support and supervision. The post Regulations For Ride-Hailing Services Make Good Sense appeared first on Honolulu Civil Beat. The recent article written by Dale Evans, “Proposed Bill Regulating Uber, Lyft is Biased Against Taxis,” was very disturbing to read. There were many inaccuracies in the article regarding Uber and Lyft regulations in the state of Hawaii, particularly Oahu, where a majority of most ride-sharing drivers reside. I would know about these regulations, because I am one of those drivers. I am not writing to you on behalf of Uber or Lyft. I am writing on behalf of myself as an independent contractor that drives for ride-sharing companies. Ordinance 16-25, enacted Aug. 17, 2016, states each private transportation driver’s vehicle must display a decal on the front and rear bumpers with the transportation network company’s logo, name or identifying symbol; a dome, for taxicabs only, or a company identifier, in the front window visible from at least 30 feet. TNCs are already regulated and required to display signage identifying themselves as Uber or Lyft vehicles. Lyft vehicles will have the emblems on the front and rear bumpers, while Uber, with permission from the director, on the rear driver-side windshield. Lyft vehicles may also have a light-up amp on the front dash that will display the riders’ name and greeting once the ride starts. Other safety features that are implemented on Uber and Lyft for riders include the driver’s current picture, the license plate of the vehicle, color of the vehicle, make and model of vehicle, and picture of vehicle on the app once the driver accepts the ride. The rider also knows how far away the driver is in minutes, the route the driver is taking, and when the driver is pulling up to greet them. These safeguards have been in place for the riders since the beginning. As for insurance, Uber and Lyft both have $1 million policies when passengers are en route at all times. If the unfortunate incident where a driver’s battery runs out during a trip, that does not mean the trip has ended. It only means the phone has died. The driver is still en route and has not ended the ride with the rider. Both the driver and rider are still covered under the insurance. The driver just needs to get a charger and end the trip once the rider has reached the destination. A driver would not close the app with a rider in the car. That would cause the driver to lose money. Drivers are out trying to make money to feed their families, pay bills, or other expenses. They are independent contractors who need to keep their app on in order to make money. There are thousands of Uber and Lyft drivers in Hawaii. By turning off the app, the driver gave that potential income to another driver and would now have to drive longer hours to provide for their family. The issue that needs to be addressed is safety for the drivers. 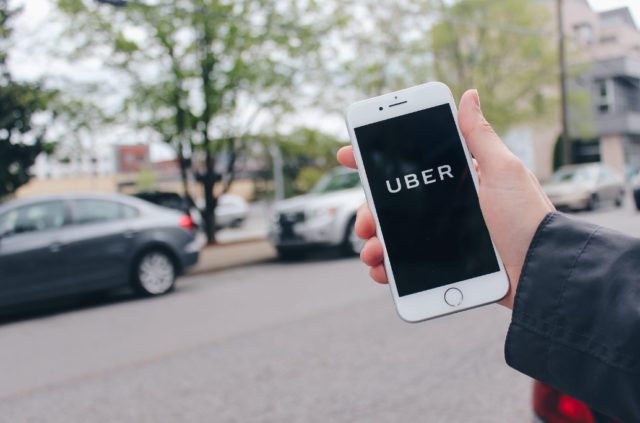 The tragedy on Jan. 27, 2019, in Tempe, Arizona, that took the life of a pregnant Lyft driver while picking up a rider started a petition to ask Uber and Lyft for safety measures for drivers. The issue that needs to be addressed is safety for the drivers. Drivers only receive a name, rating, and where the rider is to be picked up from. The names that drivers do receive are mostly fake names. Uber never gives drivers a rider’s picture, however, Lyft will give us the picture the riders upload. Most of these pictures are avatars, Snapchat pictures, or other fake pictures. If drivers are required by both Uber and Lyft to give current pictures and proper first names to the riders, shouldn’t the driver expect the same type of safety measure from the riders? This would ensure that everyone is safe, not just the rider, the driver as well. I encourage the conference committees to move forward with House Bill 1093 HD2. 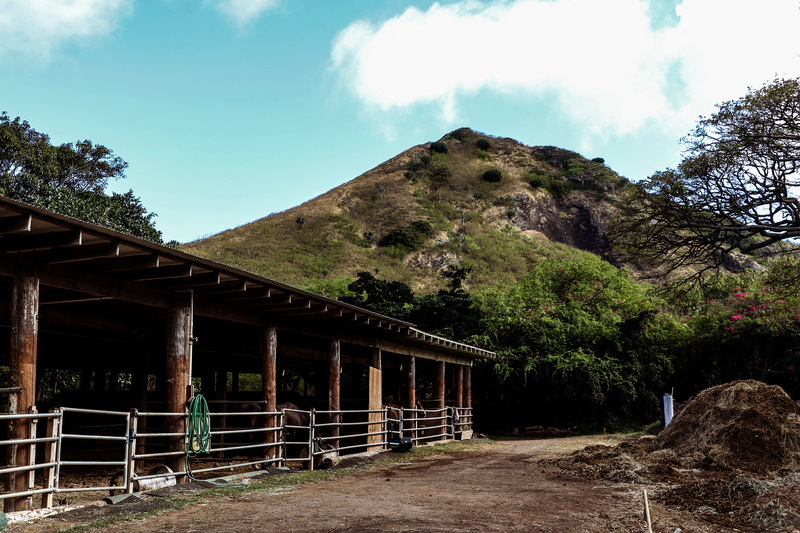 The post A ‘Vicious’ Battle Over The Future Of Koko Crater Stables appeared first on Honolulu Civil Beat. For nearly six decades, Koko Crater Stables — Oahu’s last municipal equestrian facility — has provided horseback riding and lessons to thousands of casual riders and beginners. In recent years, however, the city-owned facility struggled to stay afloat, while its stables and buildings crumbled. Now, under its latest managers, the grounds have been resuscitated. But the mission has changed, and that’s sparking a feud over who should control Koko Crater Stables and whom the facility should serve. Private boarding of horses has long been part of Koko Crater Stables. The facility no longer boards the broken-in school horses that were previously made available to beginners. Instead of a focus on casual riding for the public, Koko Crater Stables has largely morphed into a training grounds for elite, competitive riding using a herd of 20 privately owned horses boarded there. 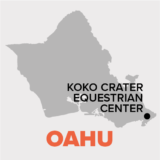 The company managing Koko Crater Stable, Horse Haven, maintains that it does make available some lessons for beginners and casual riders, and that the focus on elite riding makes the most sense for the 10-acre property nestled in the back side of the crater. The company is on the cusp of signing a deal with the city to manage the property for the next five years. The situation has exposed the sometimes cutthroat competition within Oahu’s equestrian community. Each of the two bidders claims the other was unqualified, and each claims it’s being bullied by its rival’s supporters. It’s grown so heated that Honolulu Police were called to the stables Tuesday to take a report from Horse Haven over the threats and vitriol it says it’s receiving on social media. Furthermore, questions remain about the city’s process in awarding the contract for the property, which is still ongoing. The land was deeded to the city by Bishop Estate in 1928, and the stables aim to reflect Princess Bernice Pauahi’s love of horsemanship, those familiar with the facility say. “My preference is that we have an operation that meets the vision of Princess Pauahi, which means serving the community as a municipal equestrian facility,” interim City Councilman Mike Formby said in a text message. Koko Crater Stables falls within his district. The administration should “undertake a fair and transparent procurement process awarding the concession,” Formby added. Koko Crater Stables launched in 1962 shortly before the city closed a similar municipal stables called the Town and Country in Kapiolani Park, according to Oahu native and veterinarian Emogene Yoshimura. Yoshimura learned to ride as a girl in Kapiolani Park and she later ran Koko Crater Stables until 2015, when new city requirements made it impossible for her to continue, she said. During her tenure, Yoshimura helped cover expenses by boarding about 25 horses from private owners at a time. Notably, however, she also kept 12 of her company’s own school horses there, making them available to beginners and casual riders at $45 a lesson, she said. “My goal was to share the joy of riding with the public,” Yoshimura said Tuesday. She estimates during 25 years operating the stables for the city, she provided 10,000 horseback lessons, many to “dead beginners” who were new to riding. 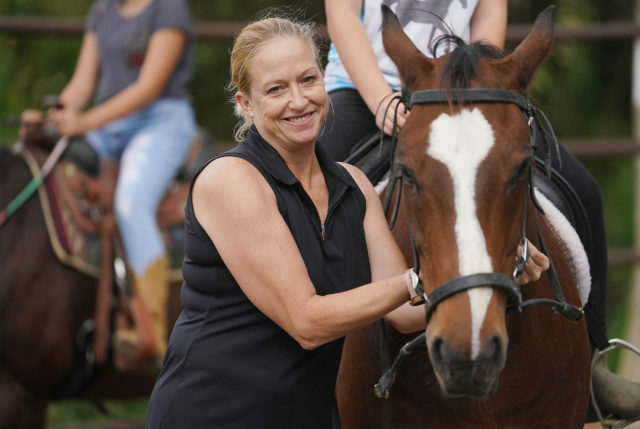 Her operation hit a setback about 10 years ago when the city prohibited her from using its botanical gardens next door for trail rides, she said. In 2015, the situation became untenable, Yoshimura said. 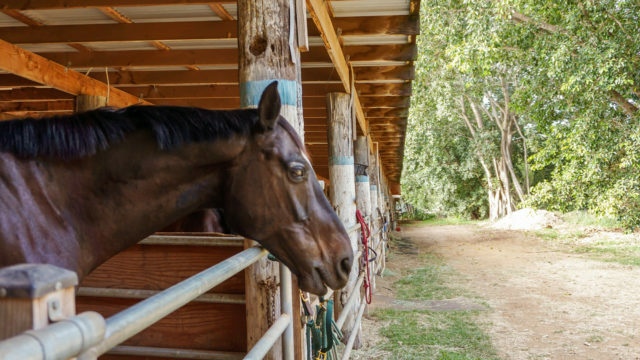 The city awarded her its latest competitive 5-year contract to keep running the stables but it also added language prohibiting caretakers from living on site, she said. Although no one could live there, the new contract still required the stables to be manned around the clock, she added. Yoshimura and others in the local horse community stressed that experienced caretakers ought to live on site in case of emergency, such as a fire. Security guards, by contrast, wouldn’t be trained for how to properly handle such events — and they’d be too expensive for round-the-clock patrols, Yoshimura said. After more than a half-century of involvement at the stables, she opted not to sign the new contract. When the owners of Horse Haven LLC took over the property about a year later they found it in “utter ruins,” company co-owner Jane Mount said. Nonetheless, Mount and her three partners, including her husband, Jerry, raised about $150,000 in loans and donations plus free labor from community members to help fix and reopen the stables, she said. The Horse Haven owners have run Koko Crater stables for the past 2 1/2 years via city-issued revocable permits. They’ve set up a nonprofit, the Koko Crater Stables Community Education Foundation, to help continue the work and host equestrian events. They’ll host a free horse show there in early May. Under their new management, however, the municipal facility’s mission has changed. The broken-in school horses that Yoshimura made available to the public are gone. 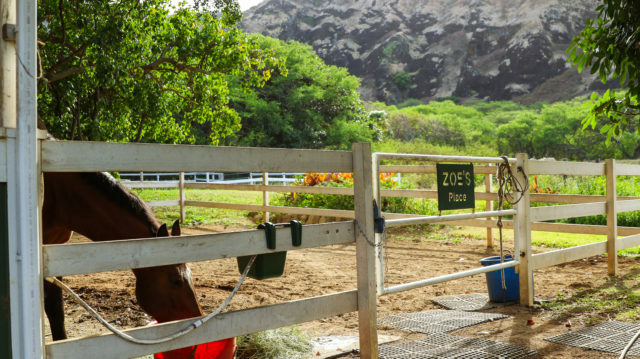 The 20 horses currently boarded at Koko Crater are either owned by private tenants — who pay $811 a month to board their animals there — or the Mounts, who board four of their horses there, Mount said. With those animals, Horse Haven runs a school for “hunter-jumping” — a competitive and advanced style of riding. About 50 percent of all lessons are given to teenagers who are serious about the sport, Mount said. “It’s basically a boarder-run facility. It’s people with a lot of money. It’s top-dollar people in that barn,” said Frank Guadagno, a local farrier who’s worked with some of the animals at Koko Crater Stables. “You’re talking $25,000 horses, $50,000 horses,” Guadagno said. Koko Crater Stables now specializes in competitive and advanced riding lessons, with all of its horses on site owned either by private boarders or by the managers themselves. The facility doesn’t cater to beginners, said Charlie Jordan, a caretaker who now lives on-site. It’s for more experienced riders — any beginners who would attempt to ride the horses there now would risk injury or death, he said. Those who ask about beginner horseback-riding are referred to private facilities on Oahu, including the stables at Kualoa Ranch, Jordan said. However, Mount said that several of the private boarders’ aging horses could in fact be used for beginners and that the private boarders who aren’t using their horses allow them to be used by others to take lessons. Nonetheless, Horse Haven doesn’t plan to buy school horses, she said. “We can’t be all things to all people,” Mount said Tuesday. So Koko Crater Stables now specializes in training competitive equestrian athletes. “That’s what our program is known for and we’re very proud of that, frankly,” she said. The hunter-jumper school makes more sense since Horse Haven can’t access the botanical garden trails, Mount said. Any basic horseback riding would be confined to a relatively small, 10-acre site, she said. It’s the same issue that stymied Yoshimura about a decade ago. The veterinarian said she’s grateful the Mounts put the effort into preserving the Koko Crater Stables. Some city officials wanted to lump it into the botanical garden instead. But Horse Haven’s “mission statement is a lot different than mine,” Yoshimura said Tuesday. Horse Haven meets that with its focus on competitive riding lessons, according to Mount. 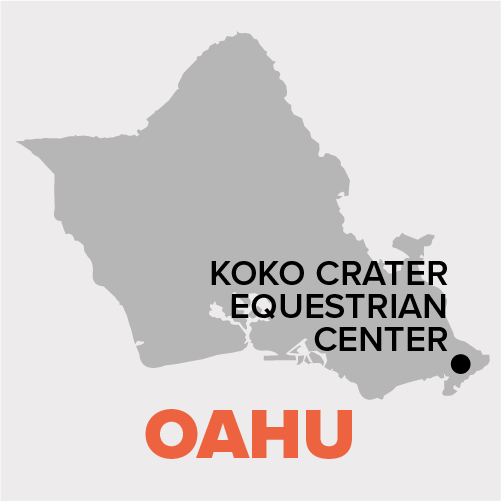 But another local instructor, Kim Hollandsworth of Aloha Riding Lessons in Waimanalo looked to run a program similar to what Yoshimura once offered at Koko Crater Stables — one she said would be more in line with the city’s intent. She challenged Horse Haven for the contract and delivered the more lucrative bid. But she still lost under circumstances that raised concerns with Formby, a former city department head who’s familiar with the procurement process. Kim Hollandsworth teaches horseback riding in Waimanalo with her company, Aloha Riding Lessons. She bid to operate Koko Crater Stables, but the city disqualified her. Officials in the city’s purchasing division contacted Hollandsworth in December about bidding for the contract, records show. She was reluctant at first, but when Hollandsworth visited Koko Crater she changed her mind. She could have boarded her nine school horses and one hunter-jumper on the site and make them available to Oahu’s “barn rats” — kids who wanted to learn how to ride and care for horses but who lacked the means to own one. Still, Hollandsworth wasn’t sure she would even qualify to bid. The city required applicants to have been in business for at least a year and grossed at least $100,000 in a year. Aloha Riding Lessons had officially opened in March 2018. 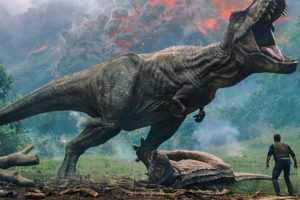 It hadn’t grossed $100,000 yet, but it was on course to make more than that by the end of its first year, she told city officials. Stables and other aging structures at the city-owned equestrian facility in Koko Crater had fallen into disrepair in recent years. The city worked with her. On Jan. 29, it declared Hollandsworth a qualified bidder. Two days later she submitted the most competitive bid. She offered to pay the city $1,513 in monthly rent — more than twice as much as Horse Haven’s $720 bid. City officials scheduled a Feb. 4 “pre-award” meeting with her. Almost as soon as Hollandsworth outbid Horse Haven, Horse Haven encouraged its boarders to lobby city officials to disqualify her. The email then provided contacts for Mayor Kirk Caldwell, the parks and recreation director and other city officials. The next day, Hollandsworth said city purchasing officials requested she provide proof she had paid rent to her current facility, DLT Stables in Waimanalo. Emails to the city show she provided them payment invoices. The request struck her as strange, she said. During the next two weeks, email correspondence shows Hollandsworth asked city officials to clarify the process and what would happen next. But she didn’t get answers. Then, on the morning of March 5, an officer in the city’s purchasing division, John Francis Sapigao, called Hollandsworth and told her she needed to pay the general excise taxes she owed within 30 minutes or she would be disqualified, Hollandsworth said. The issue had never come up before, she said. Frantic, she drove toward town from Waimanalo to try and make that deadline. She pulled over in Aina Haina when she realized she could pay online and completed the payment within the hour — but not within 30 minutes, she said. The city disqualified her. “I know you stated it was too late but I wanted you to see I followed through on what I said I would do,” Hollandsworth wrote in an email to Sapigao later that day. City officials declined to discuss the details of the Koko Crater Stables procurement. Mount said she didn’t know if her flash campaign to sway city officials led to Hollandsworth’s disqualification. “You’d have to ask the city,” she said. “It’s vicious,” Hollandsworth said of the situation. She and a core group of horse enthusiasts who support her say Horse Haven should be disqualified because the caretakers live on site. The five-year contract does prohibit using the site for “lodging and sleeping purposes,” but Mount says the owners received permission for caretakers to live there before accepting their temporary permit in 2016. Horse Haven did receive permission for management to be on duty for 24 hours, according to city spokesman Andrew Pereira. However, he wasn’t sure whether that meant caretakers could live there. He said it would probably come up in the city’s review. Horse Haven, meanwhile, expects to keep its caretakers living on-site should it receive the five-year contract, according to Mount. Formby voiced concerns about the procurement last week to Caldwell’s managing director, Roy Amemiya. “I left the ball in his court to make the final determination,” Formby said in a text Monday. Hollandsworth is weighing whether to formally challenge her disqualification. Whomever prevails, local horse enthusiasts hope the stables will keep Hawaii’s longtime equestrian tradition alive and accessible to everyone on Oahu — not just those who can afford to own a horse.